It was a successful day for Glenpark Harriers Junior athletes when they competed in the Renfrewshire Road Race Championships at a cold and windy Battery Park. There was a big turnout out especially in the under 11s, as the boys got underway over 1 mile. The young harriers were all packed closely together, and they were unfortunate not to grab the bronze team medal as they fell short by just 2 points. Douglas Campbell led the boys’ home in 8th place and was quickly followed by Euan Johnson and Connor McCorey. The girls were next and they recorded the first success of the day. Sophie McGinty looking powerful in the strong wind finished in an impressive 6th place, and with Maria McCabe and Erin McEleny just a few seconds behind they took a well-deserved team Bronze. The under 13s raced over 2 miles, and Katie Johnson stepped up to claim the clubs first individual medal of the day. 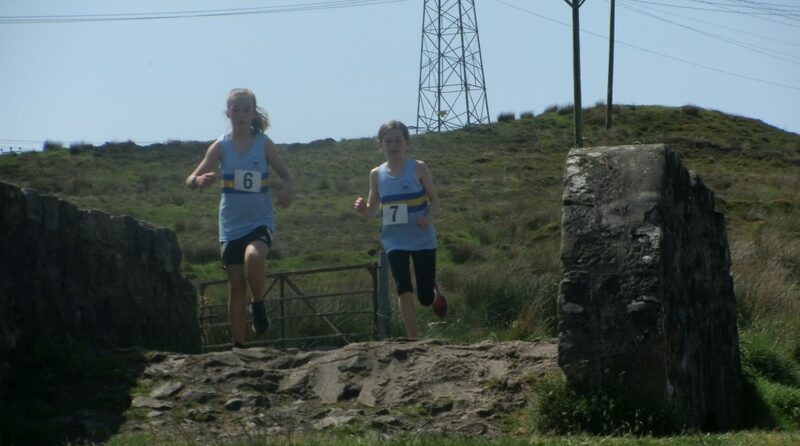 A battling run saw her place 3rd to win bronze, ahead of team mate Ava Beaton finishing in a respectable 6th. It was also a good performance from David Docherty who is looking stronger in every race. The under 15 girls’ hard work in training was rewarded as Abbie Tosh led the closely grouped quartet who were delighted with their Team Silver. The biggest improvement among the girls’ coming from Emma Aitken. Shaun Wiseman, another who has developed over the past year, put in an outstanding run to finish 8th, with his brother Alex in 16th. The best was left to last in the under 17 men’s’ race as Alan Mollins and Ewan Ferguson contested the 3 mile event. Leaving the park after 1 mile Alan was off the pace lying a distant 2nd, but in a remarkable turnaround he hit the front at half way and extended his lead to 19 seconds to win Gold and his first County title. Ewan running steadily placed 5th. Under 11s 1 Mile: 06:45 Douglas Campbell, 06:48 Euan Johnson, 06:54 Connor McCrorey, 07:01 Leo Beaton, 07:03 Cameron Crawford, 07:12 Cameron Beck, 07:37 Oliver Jones, 07:45 Ruari Trainer, 09:15 Mathew Ross, 09:31 Ben Mullen, 07:25 Sophie McGinty, 07:37 Erin McEleny, 07:38 Maria McCabe, 07:46 Brooke Taylor, 07:51 Summer Taggert, 08:05 Leah Knox. Under 13s 2 Miles: 12:44 David Docherty, 12:40 Katie Johnson, 13:31 Ava Beaton. Under 15s 2 Miles: 14:13 Abbie Tosh, 14:21 Emma Aitken, 15:04 Francesca McKay, 15:07 Olivia Trainer, 11:33 Shaun Wiseman, 14:02 Alex Wiseman. U17s 3Miles: 16:45 Alan Mollins, 19:32 Ewan Ferguson. This entry was posted in Uncategorized on February 3, 2019 by greenockglenparkharriers.